WEST MILFORD, N.J. -- A New Jersey high school student is taking a jab at her school's dress code with a quote in her senior yearbook. 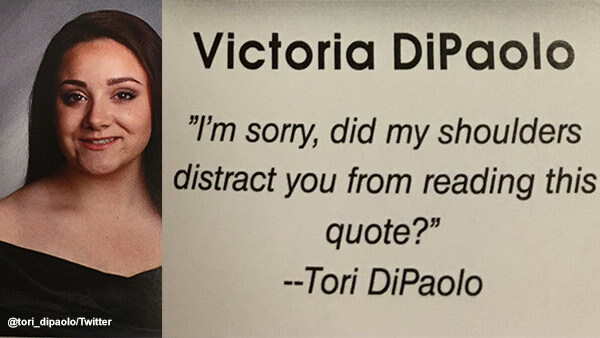 West Milford High School student Tori DiPaolo's quote reads "I'm sorry, did my shoulders distract you from reading this quote?" She tells NorthJersey.com she was referencing a portion of the school dress code that prohibits exposing shoulders. DiPaolo says the formal robes she wore in the graduation photo technically violate the dress code, which she found ironic and inspired the quote. The senior student says she doesn't mind the attention her photo has received since she posted it to her Twitter account last week, but she wants everyone to know it was meant as a joke.